Gold Cap Challenge: Update 59 Challenge Complete! I finally did it. I finished the challenge on Monday actually, with loads of gold to spare. 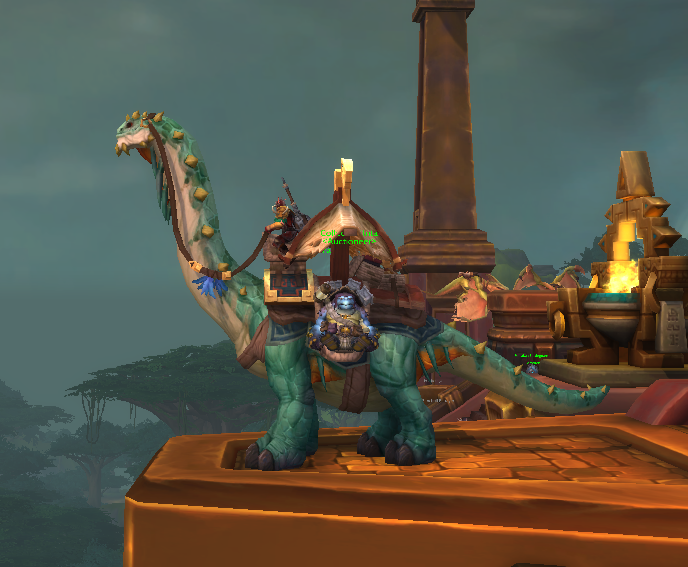 Since then I have bought the Caravan Brutosaur for 5 million, and I am now on just about 6 million gold total across both accounts after that. The only thing I did of note was to repost my auctions. I was so close to gold cap last Sunday that I didn’t really need to do anything else. Since then I have just kept up with reposting my auctions as well as buying myself the Brutosaur to celebrate. 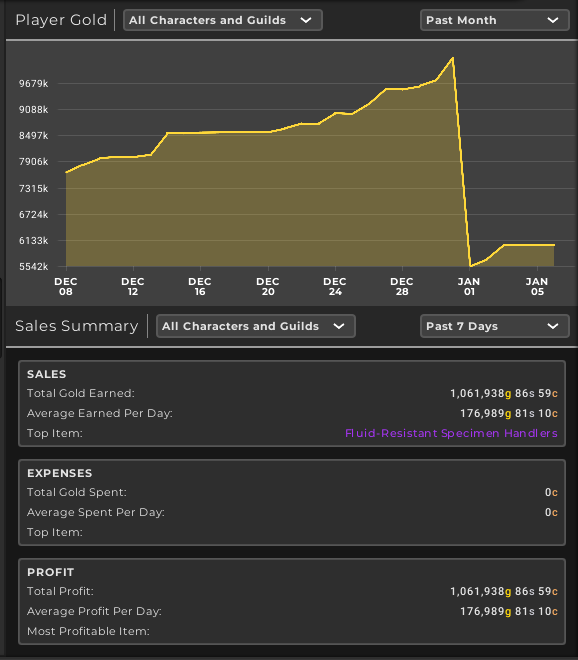 I hit 700k in sales from the time I posted on Sunday until I collected my sales on Monday to hit gold cap, which is very nice. I spent a very small amount of gold on something. As you can see from the graph below I hit gold cap and immediately mailed off 5 million to my other account. I just filled my inventory once to take the obligatory screenshot. As you can see I had a nice amount of BoE sales and Sinister combatant sales to take me past the line. 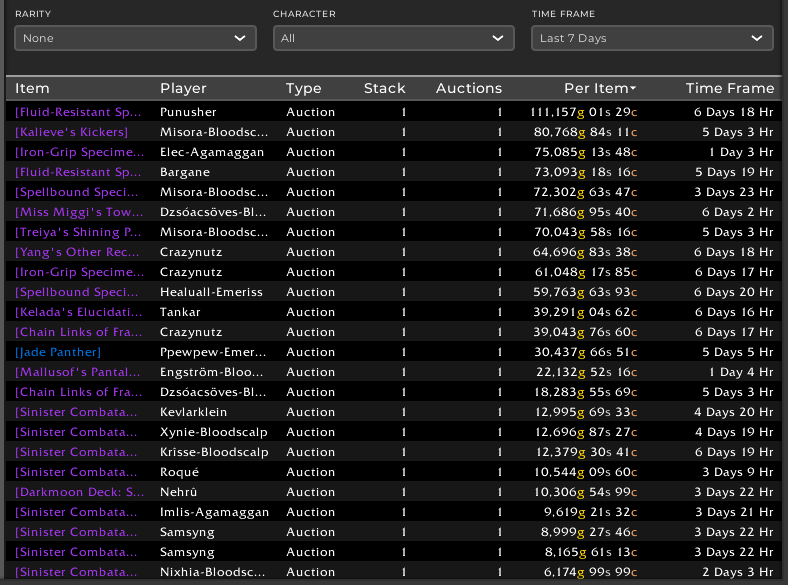 My price cut on BoEs has worked out really well in terms of moving inventory. Not sure how well it has worked when it comes to making a profit, but at this point we are so close to Dazar’alor that i don’t care too much. I end the challenge with a very healthy inventory, as I have not tried to sell everything off to quickly reach gold cap. I’ll continue posting my stuff, but going forward I will be focusing on battle pets and BoEs to generate the largest amount of gold I can. Throughout the challenge I have been saving a lot of statistics and we will take a sneak peek at some of them now. I’ll be going through the data in more detail in a post next Sunday, so stay tuned for that! My average profit margin throughout the challenge was about 25%. 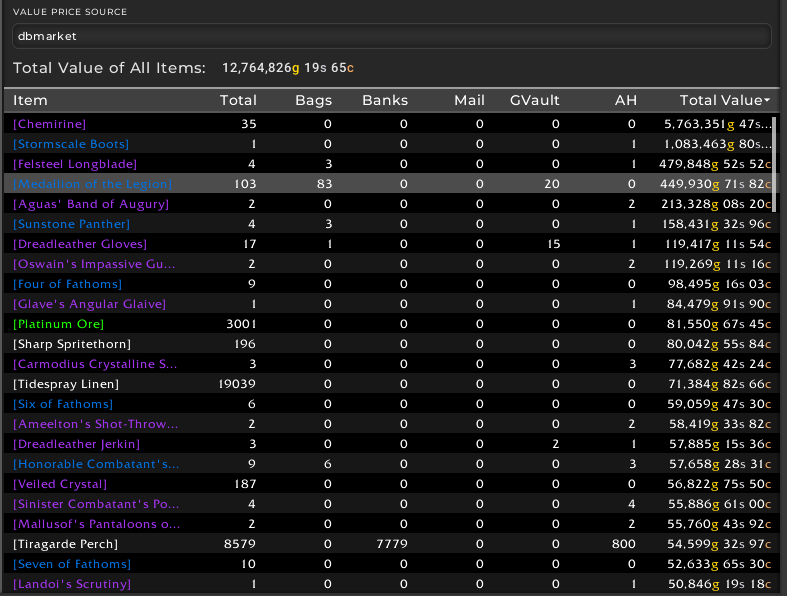 I had sales worth 51.9 million gold and I spent 41 million gold. It depends on which account’s /played time I use. I spent 279 hours logged in on the account with my lvl 120s and 337 hours logged in on my banker. Both of them include AFK time, and I was often logged into both. I made 10 560 000 gold from the start of the challenge to the end for a gold per hour between 31k and 37k gold. This includes leveling to level 110 on a DH and leveling my mage to 120, as well as tons of emissaries, PvP and other activities that do not directly yield gold. Stay tuned for next weeks post for a deeper dive into the challenge, what I learned and how this impacts my view on overall gold making. Congrats! I am nearing this myself. Have about 1.1 million to go. I’ve been moving a TON of darkmoon decks and that has really sped things up. It took me 6 months or so to get to 1 million, 2.5 more months to get to 2. 1 month to get to 3 and then in the last 8 weeks or so, I have netted almost 6 million. I think my fastest was going from 6-7 took 5 days. I fully plan on buying my AH mount as well as soon as i get my screen shot!